When I talk to my friends and family members who grew up listening to heavy metal and hard rock music through the early 70's, I'll always ask them for stories about the heavy music back then. They'll say that among the 70's metalheads, Led Zeppelin were overrated, Deep Purple was the best thing ever, and when I ask them about Caress of Steel, they say it was one of the most awesome albums when it came out (2112 pretty much blew their minds, but let's focus on this one). Apparently something like "Bastille Day" was absolutely insane in 1975, let alone a song like "The Necromancer" or the twenty minute "The Fountain of Lamneth". Too many people judge Caress of Steel from the standpoint of 2112, and forget to realize that without the pioneering done on this record, 2112 might not have happened. Even if you completely take away all historical importance from this album, it's still a pretty awesome record. 2112 this is not, but this album has a sense of unbridled aggression in tandem with a value of beauty that rarely showed up on other Rush albums. You've got the sheer anger of "Bastille Day", the down-to-earth beauty of "Return of the Prince" and "Lakeside Park", even the carefree rocker that is "I think I'm Going Bald". Even if the songwriting had yet to fully blossom, the musicianship here is top notch. The A side of this record is the best part, as it has not only "The Necromancer", but it opens with freaking "Bastille Day". "Bastille Day" is one of Rush's most aggressive tracks of the 70's featuring a set of riffs that'll more than destroy your face hole and a rhythm section that still rivaled work from 10 years later. Oh yeah, and not to mention Geddy's wicked vocals! This album is one of the best Geddy's voice has seen, with both a great use of range and an ear splitting aggression that makes you bang your head and grit your teeth. Even the silliest song on the album, "I Think I'm Going Bald", has a gritty, heavy, riff happy feel to it that makes it an enjoyable song. "The Necromancer" is really freaking awesome, it takes a long time for it to grow on you, but just listen to the section called "Return of the Prince"; you can thank me later. "Return of the Prince" is my favorite part of the whole record, this song sings to your soul; just beautiful. Side B of Caress of Steel is home of one twenty minute epic track entitled "The Fountain of Lamneth". This part of the record is great too, but it does take a while to get going. This song is sort of a blueprint for "2112", it's split into a handful of different movements with different intensities. The song also stretches the legs of Rush's narrative songwriting, which is something I adore about this band. The song is generally strong, but it suffers from a lack of continuity. Each section is separated from its neighboring section by too much silence or interluding. Don't get me wrong, long tracks are always the best when they are written flawlessly, but I can't help but feel as if "The Fountain of Lamneth" would've benefited from being separated into six different songs. All that being said, "The Fountain of Lamneth" is a definite high in Rush's career, and it marked a point in which they were exploring more and more musically. The strengths of "The Fountain of Lamneth", however, are extremely evident, and naysayers should keep listening, as there is some musical gold found here. The soft, acoustic-led passages are all amazing, and Geddy's soft singing is a perfect conveyance of the narrative lyrics. The most aggressive sections of this song are quite progressive in nature and they show off Rush's early dexterity in handling tight musical situations. The best sections of "The Fountain of Lamneth" are definitely "Panacea" and "Bacchus Plateau" whose upbeat natures are just fantastic; I wish they were longer. As a whole, "The Fountain of Lamneth" pales when compared to "2112", "Hemispheres" or "Natural Science", but one must remember this was accomplished at a relatively early stage in Rush's career, and the song stands on its own as a true work of art. The musicianship is fantastic, as it is on every Rush album. Neil's drumming began to really take shape on Caress of Steel, as was his lyricism. Neil makes frequent use of outstanding fills and unique rhythms, and they helped prove that Neil would soon be heralded as the greatest drummer of all time. Geddy's bass was also taking shape into the heavy, loud, and gritty tone that would dominate the later 70's Rush records. His tone is still somewhat hollow, but it is much louder than on the previous albums and Ged allows his Ricky to flex its muscles. His playing is also more pronounced, using many more bass fills and quick runs. The furious bass playing of "Bastille Day" rips through your ears with its complex fills and gritty attack. The rest of the album also features this style, and it's quite interesting listening to Geddy's bass tone caught in the middle of the early 70's and late 70's Rush eras. The star of the show for this album is Alex Lifeson. The gritty, gain-choked guitar tone present on this album is much more suited here than it was on 2112, actually. All of Alex's guitar solos are fantastic, especially those on "Bacchus Plateau" and "Return of the Prince". The riffs Alex plays are all heavy and driving; another thing that makes this album a bit unique. When Alex isn't playing sweet melodies, he's playing heavy, almost metal tinged swinging riffs that propel things along in an awesome fashion. I've always loved Alex's playing on this album, it really is top notch. 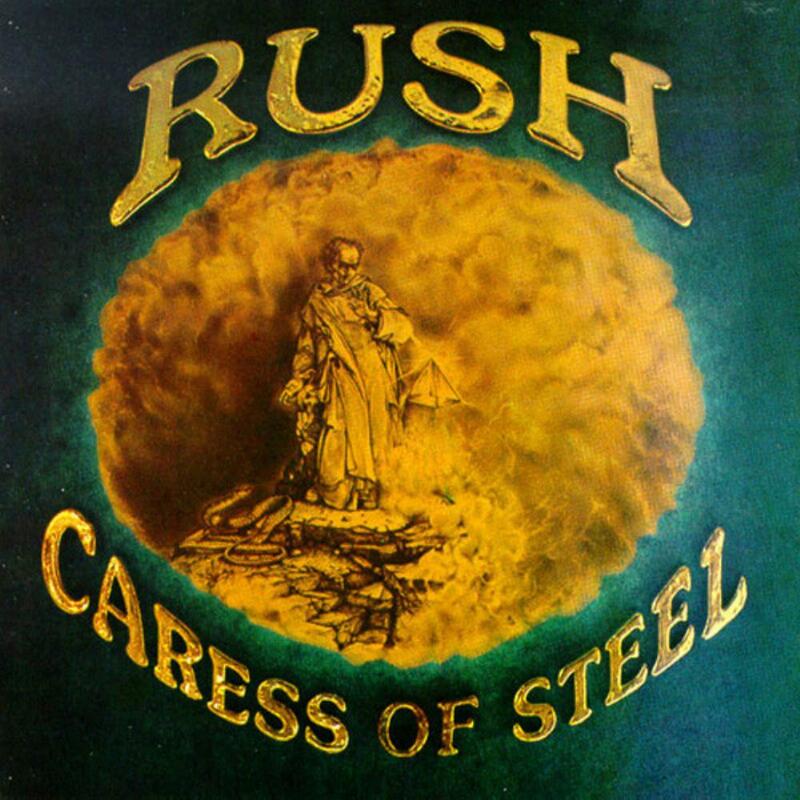 Caress of Steel really shouldn't be judged in comparison to 2112. Why so many people do this I know not why, but the album really isn't a mess, it's not annoying, it's not weak; it's just a necessary step Rush had to take. In my opinion, the results are fabulous, the album is home to some brilliant musicianship and lyricism. Sure, "I Think I'm Going Bald" might be Rush's second most ridiculous song lyric-wise, but there's also "The Necromancer", "Bastille Day" and "The Fountain of Lamneth". It's safe to say the good totally overtakes the bad here. I wouldn't recommend this be a newcomer's first Rush listen, but it definitely deserves some attention. In the end, Caress of Steel is a very strong album deserving of more recognition and praise than it gets. "But they're marching to Bastille Day La guillotine will claim her bloody prize! Free the dungeons of the innocent The king will kneel, and let his kingdom rise!"